The Maine POPS has been working really hard over the past few months to put together our first formal concert under the baton of our new Director, David Watts. There have been some wrinkles along the way – “Well, we just expected you to know!” was uttered in more than one board meeting as we set out on the first steps of this new journey! – but we’re delighted to have David on board and are really looking forward to showcasing our amazing band. With our Fall concert being a little later than usual this year, we’ve also started working on Holiday music a little earlier than normal. That has lead to an interesting blend of pieces at any given rehearsal – although there were several September evenings when it was still well over 80°F and “Let It Snow, Let It Snow, Let It Snow!” seemed like nothing but wishful thinking! 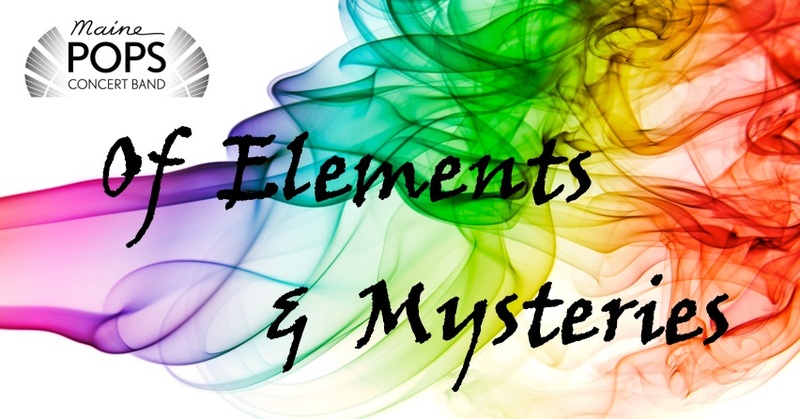 We’re hopeful that our blend of Elements and Mysteries will help ease everyone into the holiday mood with us. We’re hoping to have a good audience at our concert and we have wonderful music on the program, so we’d like to encourage you to bring your friends, family, neighbors, the fella up the road you only see once a month, and anyone else you can think of to come and share the fun! As always, tickets will be available at the door for $10, $7 for seniors, and full-time students are free. You can see the Maine POPS performing their concert “Of Elements & Mysteries” on Sunday November 19th, 2:30pm at Scarborough High School, 11 Municipal Drive.